The head of the U.S. Pacific Command said Tuesday that population growth, competition for resources and the rise of China will create strategic threats for the Navy for years to come. Locklear noted that the vast region from “Hollywood to Bollywood” is home to most of humanity, the largest economies and navies, and the most frequent national disasters. He said he worried about “young, disenfranchised 15- to 19-year-olds” growing up without opportunities in the Pacific region. “It’s going to cause countries and governments to fail, and it’s probably going to result in organizations like ISIL,” he said, referring to the Islamic group threatening Iraq. Locklear spoke at a breakfast meeting of the San Diego Military Advisory Council, a group that promotes cooperation between the military and the greater San Diego community, at the Admiral Kidd Center on Naval Base Pt. Loma. North Korea is the “most dangerous security threat” because of its nuclear weapons. The East China Sea is in a “dangerous equilibrium” now, but is a threat because of historical disputes, rising Chinese power and competition for fishing and oil rights. Russia is not a problem yet, but growing air and naval activity in the North Pacific is indicative of the future threat. China is well integrated into the world economy, but “on the security side they’re struggling…China is going to have to make some hard decisions about how it performs in the security environment.” He praised the Chinese involvement in the multi-national RIMPAC expercise last month. On the positive side, he noted strong alliances with Japan, Australia and South Korea, and growing cooperation with India and the Philippines. He said the Navy needs stability in budgeting in order to plan for the future, and expressed concern about a fleet that is too small. 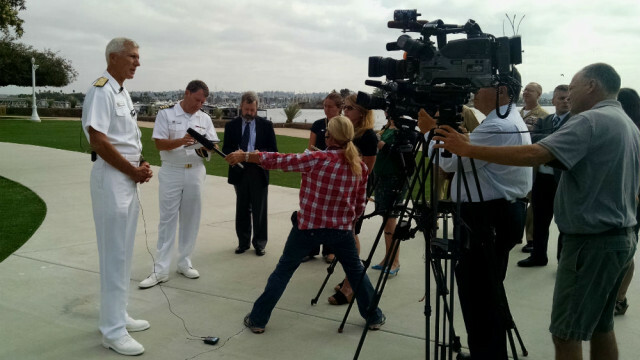 Locklear praised the port of San Diego, with its shipyards and repair facilities, as a “true strategic location” that needs continued support.